What would you do if you discovered there was more to the story behind your childhood? If you were someone else? In Another Life is a light mystery, with plenty of family drama and a touch of romance. Chloe Holden’s lire has been torn apart. First her parents went through a messy divorce after her father had an affair, then her mother was diagnosed with cancer and now she has been forced to move to a new town, away from her friends. But when she literally runs into a hot guy her first moment in town, perhaps things are looking up. Until Cash reveals that he thinks she is the long lost daughter of his foster parents, kidnapped when she was just three years old. Together, Cash and Chloe work to uncover the truth about her adoption, growing closer, but their investigation could lead them both into serious danger. If You’re Out There is an ode to the power of friendship. And while this YA title’s focus is on the friendship between two girls, there is the added bonus of sweet romance, diverse characters, and interesting and complex family dynamics, as well as the thread of mystery that weaves throughout the story. All in all, If You’re Out There is unique and delightful. What You Hide is one part contemporary, the other part mystery thriller. It is a touching and thought-provoking story of family breakdown and youth homelessness, a coming of age story and a love story rolled into one. When Mallory’s pregnant mother changes her mind about leaving her controlling and demanding husband (Malloy’s stepfather), Mallory makes the decision to leave by herself. This new plan means that she has nowhere to go. Enrolled in online school, she spends her days at the library and, once her welcome wears out her friend’s home, her nights too. It’s at the library that she meets Spencer. Seemingly living a perfect life, Spencer reveals he is working at the library to serve out his community service sentence and that he is struggling with decisions about the future. But then a body is found in the library and signs show that Mallory isn’t the only one hiding in the library. Eighteen-year-old auto mechanic Sawyer Taft did not expect her estranged grandmother to show up at her apartment door and offer her a six-figure contract to participate in debutante season. And she definitely never imagined she would accept. But when she realizes that immersing herself in her grandmother’s “society” might mean discovering the answer to the biggest mystery of her life-her father’s identity-she signs on the dotted line and braces herself for a year of makeovers, big dresses, bigger egos, and a whole lot of bless your heart. The one thing she doesn’t expect to find is friendship, but as she’s drawn into a group of debutantes with scandalous, dangerous secrets of their own, Sawyer quickly discovers that her family isn’t the only mainstay of high society with skeletons in their closet. There are people in her grandmother’s glittering world who are not what they appear, and no one wants Sawyer poking her nose into the past. As she navigates the twisted relationships between her new friends and their powerful parents, Sawyer’s search for the truth about her own origins is just the beginning. I would usually steer away from books about Debutante balls and the drama that might accompany such events, but Little White Lies is written by Jennifer Lynn Barnes, so instead it became one of my most anticipated reads of 2018. And it did not disappoint. Only Barnes could create such a setting and accompany it with breathless tension and mystery, expertly combined with humour and good old insult-laden compliments. Sawyer Taft has never known who her father is – her mother refused to speak of him or the life she left behind. But when Sawyer’s maternal grandmother makes a sudden appearance, she promises both answers and a whole lot of money if Sawyer will agree to live with her for nine months and become a Debutante. While trying to find her own answers about her mother’s past and her unknown father, Sawyer becomes entangled in another mystery, all while juggling brunch, dress fittings, and the special kind of horror that is a spa day. I am always on the lookout for new YA thrillers and The Perfect Candidate was, quite literally, the perfect candidate. In his debut, Peter Stone has created a thrilling and thoroughly enjoyable novel, with twists, tension, high-stakes investigations, humour and a touch of romance. Cameron Carter has worked hard to land a top summer internship in Washington DC with up and coming Congressman Billy Beck. But when a fellow staff member dies, Cameron is drawn into the mystery surrounding her death. When an FBI agent recruits Cameron to do a bit of quiet digging in the office, Cameron puts himself, as well as his family’s future, in the line of fire. With some help from his roommates and fellow interns and (slightly more useful help) from his new girlfriend who happens to be the Mexican Ambassador’s daughter, this summer internship is proving to be far more interesting and dangerous than Cameron ever expected. Nikki Kill doesn’t see the world in black and white. Her synesthesia shades everything in view, transforming numbers, words, and emotions into colourful clues. Which means she’s a dangerous commodity to anyone with something to hide. Nikki has already taken on the Hollises—one of L.A.’s most powerful families—for murdering her half sister, Peyton. However, Nikki’s next steps are clouded by the grey of uncertainty. Before she knows it, Nikki is on the trail of a cold case that couldn’t be any more personal—the death of her mother. Break Us is the third and final book in the amazing Nikki Kill series. Mystery, suspense and just a touch of romance (finally!!) culminate in a brilliant conclusion. This review may contain spoilers for the first and second book in the Nikki Kill series. If you are looking for mature YA mystery, with a daring protagonist and thrilling twists and turns, check out Shade Me. Nikki has spent the last few months looking for answers. The world might have moved on, but Nikki knows a murderer is still on the loose. Meanwhile, Detective Chris Martinez is slowly recovering on an attack on his life. With Chris’ memories scattered, it is up to Nikki to encourage Chris to continue searching for answers, before they are both targeted again. Seventeen-year-old Sloane Sullivan has survived witness protection by learning three important lessons: blend in, don’t let anyone get too close, and follow the rules. After nearly eight years and countless identities, blending in is easy. Now that someone has confessed to the murder she witnessed, Sloane’s been given her final identity. All she has to do is turn eighteen and coast through the last two months of her senior year without any complications, and she’ll be officially released from WITSEC. Piece of cake. Then on her first day she runs into Jason Thomas—literally the boy next door from her childhood. She knows she shouldn’t have contact with him, but she doesn’t expect the feelings that come with seeing Jason again. Feelings of finally belonging somewhere, of remembering who she really is, and of suspicion that there’s more to the crime she witnessed than she ever knew. Sloane knows the rule for this situation, but telling the Marshals about Jason would mean getting whisked away to yet another new identity, leaving both Jason and the future she’s painstakingly planned behind. If she can keep Jason a secret, Sloane has a chance to take back her life in a way that she never imagined possible. But doing so puts both their lives at risk: the closer Sloane gets to Jason, the more she remembers and the clearer it becomes that someone is still after her. The Disappearance of Sloane Sullivan is a mystery thriller with some amazing twists that I never saw coming and it touches upon some pretty dark crimes, but on the whole it is quite a lighthearted book, focusing on interpersonal relationships, high-school drama, and romance. The Disappearance of Sloane Sullivan is an easy book to read and enjoy, with a likeable main protagonist and some intense relationships. Sloane knows how to stay hidden in plain sight. This move and name change will be her nineteenth in eight years, ever since she witnessed a horrible crime and was forced to enter witness protection. Now Sloane is restarting her final year of high school, counting down the weeks until she will be finally free, but is thrown when one of the first people she meets is her childhood best friend, Jason Thomas. Sloane is convinced she can maintain her new identity to prevent having to move again, but staying means putting Jason in danger and risking her own future. The Disappearance of Sloane Sullivan starts with a bang and a seriously awesome prologue. Immediately gripping and then downright clever, I was hooked right from the very first page and couldn’t wait to jump into the rest of the story. The details of Sloane’s life emerge slowly, woven through the story of Sloane starting yet another high school and through flashback snippets from the past eight years. 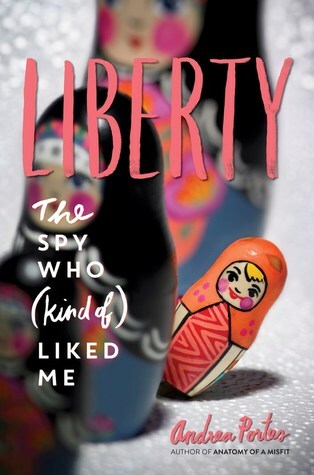 Liberty – The Spy Who (Kind of) Liked Me is absolutely hilarious. It is a super fun, caper of a spy novel with an instantly likeable protagonist. Paige Nolan’s parents, high profile journalists, are missing. They may be dead, Paige was never told. So when Paige is recruited from her (mostly) mundane college life by a spy (handsome, is younger than expected, and wears a suit very nicely), she is at first incredulous, then reluctant, but finally agrees knowing it might be the only chance of finding her parents. The synopsis for this sounded fantastic, but it wasn’t until I started reading that I got an idea of just how awesome this book was going to be. I was captured from the first page and I didn’t not want to be released. The book is written in second person. Extremely hard to pull off and yet this book does it flawlessly. Paige is talking directly to the reader, warning them about the story to come, filling in a few details about how the whole thing came to be, and then providing commentary the whole way through the story. It is very well written, the reader is at once both in Paige’s head and right amongst the action. Kaia has been on the run her whole life. The daughter of professional assassins, she knows true danger—and she’ll do anything to survive. After her parents vanished during a job gone bad, Kaia’s spent the last year in hiding, trying to blend in as an ordinary teenager, and there’s no one who makes her feel more normal or more special than her boyfriend, Oliver. But when she’s jumped by a hit man, and Oliver catches her fighting back, Kaia’s secret is exposed. In a split-second decision, she flees the small town, taking Oliver with her. With professional killers stalking their every move, can Oliver and Kaia protect each other long enough to uncover the mysteries of her past? 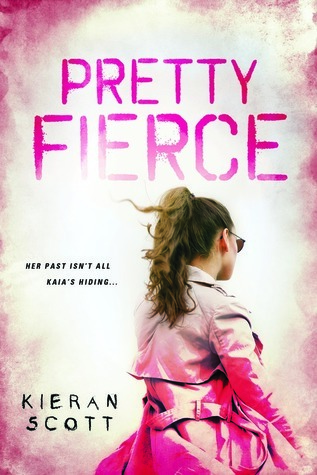 Pretty Fierce is a thrilling story, with plenty of action and drama. It took me a few chapters to situate myself within the story, but the action soon grabbed my attention. But while this book has plenty of dangerous situations, high speed chases and guns to the forehead, it retains a sweetness and playfulness. The title is therefore apt, it is both Fierce and Pretty. Eighteen months ago, while on a mission with her parents, Kaia and her mother were attacked. Her family was destroyed, her parents were both missing presumed dead, and Kaia put into action the plan that was only to be used if everything went terribly wrong. For the past 18 months, Kaia has been living with her ‘grandparents’, colleagues of her assassin parents. She has the most wonderful boyfriend, Oliver, and she is no longer endlessly plagued by nightmares. But all those fears resurface when she is brutally attacked and Oliver sees her take out her assailant. Now her secrets have been revealed and she isn’t sure Oliver will want to stick by the crazy girl who was raised by assassins. Kieran Scott says this story was inspired by a dream starring Chris Hemsworth – I knew there was a reason I enjoyed this story. It’s fun, playful and still has all those elements of a high-speed, action blockbuster.